The VA team, which justified choosing Cerner without a bidding process by claiming it would create “seamless care,” has stopped using that term and now just says VA doctors will be able to see DoD records, which they can already do with their old systems. The White House rejected qualified candidates for CIO and other oversight roles and instead proposed former Trump campaign officials who have no health IT experience. One of those rejected candidates was former Sutter Health CIO Jon Manis, who questioned the role of Bruce Moskowitz, MD — the physician member of the Mar-a-Lago group of Trump supporters that was reported to be meddling in VA affairs – and feared that the project’s politics and instability would make the job impossible. Since-fired VA Secretary David Shulkin, MD sent Cerner reps packing when they showed PowerPoints instead of something real, explaining that he planned to hold Cerner to a higher standard than just installing its standard software. He expected to create a single lifetime health record with computerized decision support. A group of hospital executives warned the VA that Cerner’s off-the-shelf product and VA-DoD data synchronization would not by itself achieve the VA’s goal of seamless care. 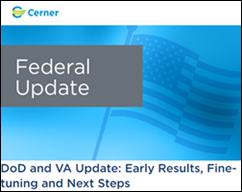 The VA’s project to mine EHR data for key clinical insights was abandoned with the selection of Cerner, which turned out to not have those capabilities. Cerner was found to be missing key VA capabilities such as Agent Orange exposure, spinal cord injury, and PTSD. The DoD has proposed sending only 1-3 years of service member and dependent records to the VA’s new system. 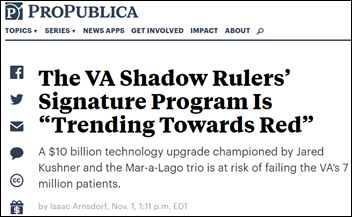 Since-resigned VA CHIO Genevieve Morris could not get VA clinicians to participate and found herself in a political power struggle with new CIO Camilo Sandoval (no health IT experience), John Windom (whose expertise is procurement), and Rich Stone, MD (the VA’s top health official). The VA spent at least $874,000 on a kickoff event held at Cerner’s headquarters, where Morris and Windom argued over stage time and walk-on songs and tried to gloss over the project’s convoluted org chart. The DoD is so concerned about VA’s project oversight that they have proposed taking the project over, although the Pentagon’s lawyers said that probably isn’t legal. From Fortune Teller: “Re: Medicare’s Patients Over Paperwork initiative. Do you have a prediction on what to expect?” I’ll let readers and Dr. Jayne chime in on the proposed changes to E&M codes, office visit documentation, and other paperwork that were first floated by CMS a year ago. It’s hard to separate meaningful HHS/CMS announcements from the political rhetoric spouted by its campaigner-appointees, so I’ve quit trying. I added a “Add/Read Comments” button at the bottom of this post. It will make it easier to add a comment after reading. Let me know what you think. Mrs. HIStalk shamed me into accompanying to seeing yet another movie (a rarity for me), in which case I give “First Man” a B- for being dull, presumably accurate, and nausea-inducing for using the “shaky cam” such that living room scenes are far harder to watch than when Gemini and Apollo spacecraft are careening wildly through space (“The Right Stuff” is about a hundred times better in every way). Before that, I laughed out loud at the preview of awful-looking sing-along, Queen-approved puff piece “Bohemian Rhapsody” as the audience all reflexively ducked to avoid being gored by the massive fake teeth of Freddy Mercury (Rami Malek). Orion Health finalizes its sale of Rhapsody to technology investment firm Hg, enabling Rhapsody to launch as an independent company in Boston under the leadership of former McKesson executive Erkan Akyuz. The company, which offers health data integration software, plans to increase staff by 40 percent over the next 18 months. Bloomberg reports that Elliott Management and Veritas Capital have teamed up to bid on Athenahealth. Veritas acquired GE’s ambulatory care, revenue-cycle, and workforce management software business for $1 billion in April. Allscripts reports Q3 results: revenue up 16 percent, EPS $-0.20 vs. –$0.16, missing Wall Street expectations for both. Shares were down 9 percent in early after-hours trading Thursday following the announcement. The company has eliminated the COO role that was vacated with Scott Bostick’s resignation in September 2018, with sales and services now reporting directly to the executive team. The company will add new financial services and contract management offerings. Long implementation cycles with all-in customers reduced the conversion of bookings to revenue. NextGen isn’t seeing any sales benefit of Athenahealth’s tribulations, saying that ambulatory physicians look purely at products rather than investor-side activity. The company is making a push to upgrade the 50 percent of its clients that are on older product versions and will eventually implement end-of-life support. Meditech reports Q3 results: revenue down 2 percent, EPS $0.52 vs. $0.47. Product venue slipped 7 percent due to implementation delays. McKesson CEO John Hammergren will retire on March 31, 2019. to be replaced by President/COO Brian Tyler. PeraHealth hires industry long-timer Greg White (PerfectServe) as CEO. Hawaii Health Information Exchange will implement NextGate’s cloud-based provider registry and enterprise master patient index. Asquam Community Health Collaborative (NH) signs a managed services agreement with Huntzinger Management Group for LRGHealthcare and Speare Memorial Hospital. Asquam’s IT staff will become Huntzinger employees. Citizens Medical Center (TX) selects automated pre-bill coding analysis software from Streamline Health Solutions. Lake Regional Health System (MO) will implement Cerner Millennium in collaboration with University of Missouri Health Care. Inova Health System (VA) will expand the rollout of Spok Care Connect clinical alerting beyond its initial implementation at Inova Fairfax Hospital. Adventist Health System (FL) implements Glytec’s EGlycemic Management System at 33 facilities in seven states. Cerner Government Services President Travis Dalton provides an update on the company’s DoD and VA software implementation efforts, highlighting workflow and care improvements made at the initial DoD implementation sites and the company’s receptiveness to progress reports from those facilities, which, as he acknowledges, have been seen by some as setbacks. He adds that the company is ready to kick off implementations at military medical facilities in California and Idaho. 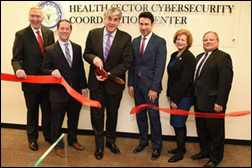 HHS re-launches the Healthcare Cybersecurity and Communications Integration Center as the Health Sector Cybersecurity Coordination Center. HC3 will operate under the authority of the Department of Homeland Security. The initial HCCIC suffered from organizational delays and leadership setbacks tied to allegations of ethics violations that led to an OIG investigation. Some data about associate benefits was posted on a password-restricted intranet site. The personally identifiable information was not exposed or accessed by anyone from outside the company. The data was viewed by a small group of associates, all of whom have had extensive HIPAA training. Due to the limited nature of the exposure, we determined that this did not constitute a data breach and we are not formally reporting this matter. IBM’s Red Hat acquisition will enable it to move Watson Health services to a hybrid cloud model, which the company says will give customers easier access to data for analytics and AI projects. Initial converted data sets will include claims and patient data from IBM’s Truven Health Analytics, Explorys, and Phytel acquisitions. A Kaiser Health News report says that precision medicine for cancer treatment sounds good, but insurers cover the cost poorly if at all because the treatments are off label and evidence is lacking that they extend lifespan. The article profiled a breast cancer patient who can’t afford the $17,000 per month cost of AstraZeneca’s drug, and after the story ran, the drug company immediately offered to comp it (thus proving that in our unbelievably screwed-up healthcare non-system, the biggest shortage we have isn’t of doctors or other clinicians, but rather reporters). A nurse in Germany who is serving a life sentence for killing two hospitalized patients confesses to killing at least 100 more in two hospitals, explaining that he enjoyed trying to resuscitate the patients he chose randomly to inject with arrhythmia-inducing drugs. Authorities and the families of his alleged victims question why he wasn’t caught sooner, even in one case in which he was caught in the act of injecting a patient but was allowed to work for another two days, during which time he killed another one. Hospital records showed that death and resuscitation rates doubled when he was working, a nice piece of analytical work in every way except timeliness. Mobile Heartbeat attains 100,000 monthly active users of its MH-CURE unified clinical communications platform. EClinicalWorks will exhibit at AAP 2018 November 3-5 in Orlando. Allina Health CIO Jonathan Shoemaker and Health Catalyst win CHIME’s 2018 Collaboration Award. Nuance shares results following Piedmont Healthcare’s implementation of the company’s clinical documentation products. Formativ Health publishes a new white paper detailing ways providers can grow and maintain their patient panels. Kids Rock Cancer Center shares how FormFast has benefitted its care team. CHIME names Nuance Communications VP Kali Durgampudi its 2018 Foundation Industry Leader. Bumrungrad International Hospital in Thailand implements the InterSystems TrakCare EHR. ChartLogic parent company MedSphere supports federal efforts to alleviate the opioid epidemic. What could this possibly mean? You can’t document the care of a patient with these conditions in Cerner? Couldn’t you do that in any EHR? “The VA’s project to mine EHR data… was abandoned with the selection of Cerner, which turned out to not have those capabilities. One can certainly “mine” EHR data from Cerner (or any EHR). This one sounds at best unfair and at worst absurd. No doubt the project has problems, but statements like this sound like something got lost in translation. I like that idea as a name for either a band or a song. In fact, it could be the VA’s next walk-on song for their next taxpayer-funded shindig. Although it should really be “toward” without the “s” according to most dictionaries and AP Stylebook, at least when used in the US and Canada (ProPublica was just quoting the Cerner report, apparently, so that’s where the superfluous “s” slipped in). Reading that ProPublica piece is /facepalm the whole way through, no clinical governance at all and being run by people with no experience. When experienced people bail during recruitment, and you answer experts’ concerns with the contract with “no change required” in every instance (that Huff document), that’s a sign your project is off to a bad start. I hope they can turn this around for the sake of our veterans, but who’s going to want to jump onto this grenade at this point?